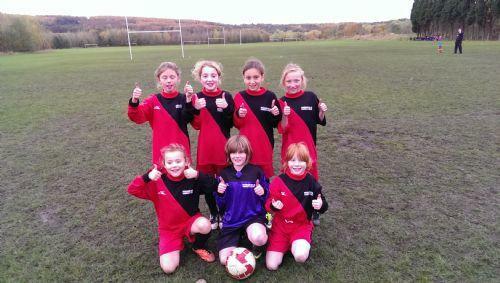 On Friday November 15th our girls football team took part in a tournament at Whickham Fellside YPC. We played four games, winning two and losing two and every girl was fantastic. The conditions were poor with boggy and small pitches but the girls tried to play football throughout and never stopped trying. In a very even and competitive game we went down 1-0 with South Street scoring a long range effort towards the end of the game. We had lots of chances but unfortunately didnt take any. By now the girls were well and truly warmed up and Chloe scored within 5 second of kicking off! She followed this up with another goal and the impressive Olivia added 2 more to make it 4-0 in a game we completed dominated. Another fantastic performance from the team seen Highfield dominate the match from the first second until the last. The ever impressive Chloe scoring a hatrick and Tegan scoring a long range drive. In our last game we created some good chances but were beaten by a good St Josephs side with an excellent midfielder who scored two great goals. All of the girls were fantastic and are raring to go for the next tournament in March!